Milton Freidman observed that Americans usually self-describe as individualists but it would be more accurate to describe Americans as a family-oriented culture. He pointed to the self-sacrifice that parents often make on behalf of children, which would not make sense unless you valued your children more than yourself. “You know, the thing that is amazing, that people don’t really recognize, is the extent to which the market system has in fact encouraged people and enabled people to work hard and sacrifice in what I must confess I often regard as an irrational way, for the benefit of their children. One of the most curious things to me, in observation, is that almost all … Read the rest of this article! 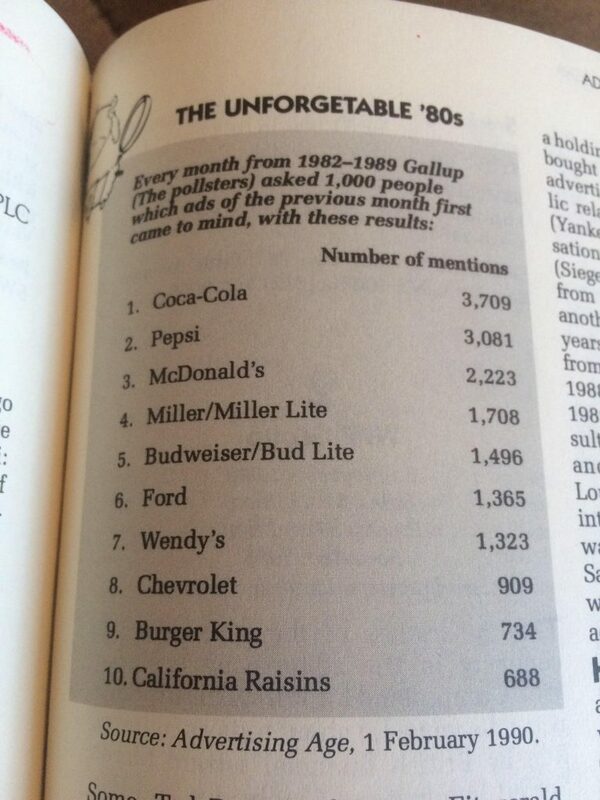 In the February 1, 1990 edition of “Advertising Age”, the advertising magazine collected answers to a 1982-1989 Gallup that asked customers for the most memorable ads that they had encountered over the previous month. Coca-Cola came in the #1 spot with 3,700 remembrances, followed by Pepsi in the $2 spot with a little over 3,000 remembrances. At the time, Pepsi was winning the cola war, with its eponymous brand accounting for almost 20% of the overall beverage market (at the time, Coca-Cola accounted for 16% of the market). Over the past three decades, however, it is absolutely stunning how much Pepsi has ceded ground to Coca-Cola in the sale of its signature brand.… Read the rest of this article!